The Weiser Phoenix knob is a popular flattened round shape with a decorative face for a subtle distinction. 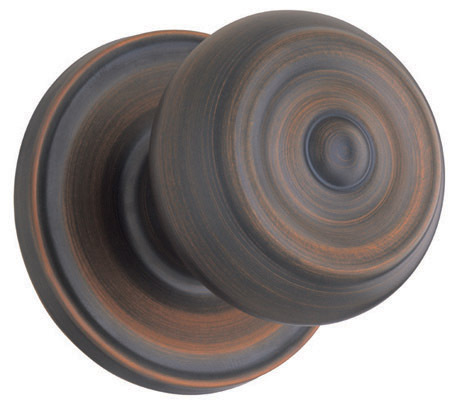 Available in multiple finishes, the Phoenix knob is versatile in coordinating your home decor. - Door Thickness 1 3/8" - 1 3/4"
- Cylinder: Smart Key Standard. KW or WS 5 Pin upon request. 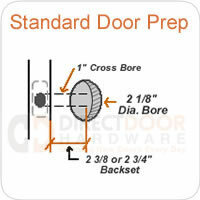 Be sure to order your Weiser Deadbolts too so we can key them alike. 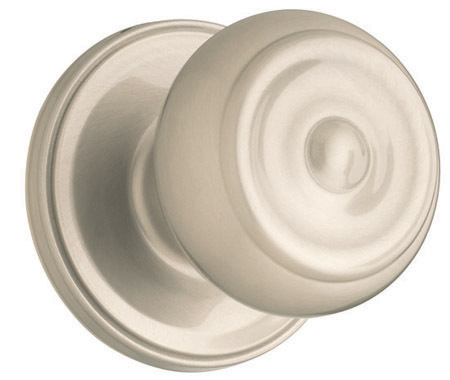 Weiser door knobs are available in several functions. 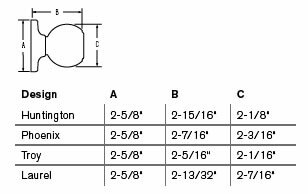 Please review the descriptions below so you can order the correct door knob for your application. 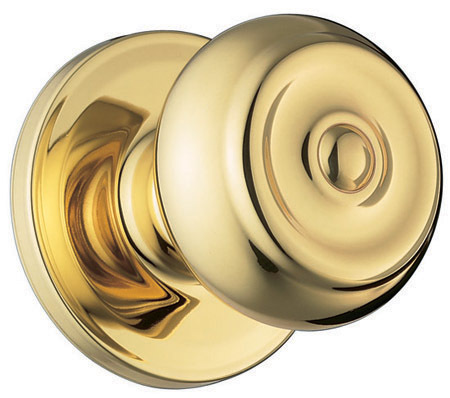 Weiser Passage [GA101] or Hall and Closet Doorknobs are used on doors that do not require a locking mechanism. Halls, closets, pantry or laundry doors will generally use a passage knobset. Passage knobs do not have a locking mechanism. Weiser Privacy [GA331] or Bed and Bath Door Knobs are most often used on Bedrooms, Baths or Office doors where a lock for privacy while occupied is desired, but a keyed lock is not really necessary. Schlage privacy knobs have a turn button on the end of the knob as shown to the left to activate the lock. On the outside, there is a pin hole for emergency unlocking. Some knobs will have a pin hole inside a circular piece, some just have a small pinhole. Weiser Keyed Entrance [GA535] Door Knobs are generally used on exterior doors, but sometimes used on interior doors where security is a concern. Schlage keyed entrance knobs have a push pin lock on the inside backplate, similar to a privacy lock. On the outside there is a keyed cylinder. If the knob is locked from the inside a key is required for entrance. If you are ordering several keyed locks of the same brand we can key them alike for you. 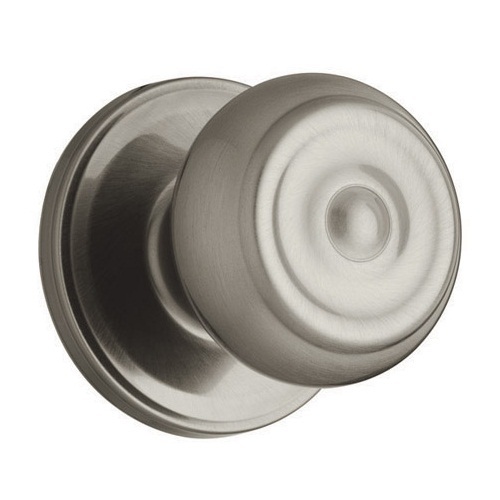 Weiser Single Dummy [GA12] Doorknobs are sold individually. Dummy knobs do not have a latch or mechanism of any kind. These knobs are surface mounted to a door that has not been bored (large hole cut out) for a doorknob. Dummy knobs are generally used on double doors that us a ball catch at the top to keep them closed so a latch is not required. They are also commonly found on the inactive side of a french door - a single dummy monted on either side of the inactive door. Weiser door knobs can be returned within 60 days of purchase. Before returning you must obtain a return authorization number so that we can get your credit properly issued. There is a 15% restocking fee on all returned Weiser hardware. Please see our returns page for more details. Perfect match to our bedroom knobs at 1/3 the cost they wanted at homedepot here in Canada as a special order! This is an excellent doorknob. It looks great and works great. Easy to install! Perfect! Thankyou for a speedy delivery! I was trying to match up a discontinued door know with my existing knobs in the upstairs area. I felt fortunate to find a company still had some. I'm very happy with my purchase and will and do recommend them to friends and family. Does the faceplate have square edges or rounded? The locks in my home are all Weiser so the keys will fit this new one if I can rekey it. Replacing old Weiser knobs. Both strike plate and strike latch on old knob is 2.5" high, not 2.25" high. What height are the strike plate and strike latch on these new Weiser knobs?